Never mind the five-cent cigar. What this country needs is a good economic bull-detector program—along the lines of the faculty that Ernest Hemingway famously advised writers to develop—available in formats ranging from an iPhone application and giant SAP software to a free Linux version downloadable from the Web. Such a sensibility, put on a computer and run, would be especially useful with respect to those putative forms of non-fiction known as investment advice and political persuasion. The power of money to amplify a message is surely very great: a press release, an analyst’s report, a favorable book, multiplied by many millions of dollars, can turn a plausible wish into a widely shared conviction. The power to structure or to disguise information, even to withhold it, is greater still. But such mastery is far from absolute. If you can measure what is entailed by a proposition, if you can express it in numbers, you have a chance of knowing something about it. Lord Kelvin, shake hands with Mr. Hemingway: empiricism, meet narrative. 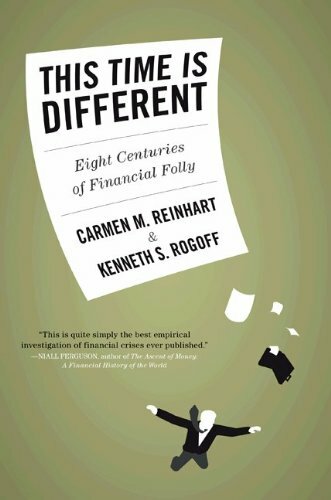 This Time Is Different: Eight Centuries of Financial Folly, by Carmen M. Reinhart and Kenneth S. Rogoff, Cabot professor of public policy, is an unusually powerful bull detector designed to protect investors and taxpayers alike—eventually, at least, and provided the spirit is willing. At this time of global and domestic economic crises—with their concurrent political and diplomatic ramifications—all of which seemingly took policymakers, investors, and the public by surprise—any evidence that warning signs of such disasters can be analyzed in advance is to be warmly welcomed. And in fact, here it is, useful not only for the present circumstances but as a brisk reminder of the recurrence of human folly, or the willful ignorance that passes for it. Seldom has a book arrived containing more moving parts between its covers. For instance, it is easy to mistake This Time Is Different for the many books that have appeared over the years about the history of international financial crises, long on story-telling flair but short on data. The most famous of these, Charles P. Kindleberger’s Mania, Panics and Crashes, is wonderful fun to read. There are, however, few yarns in Reinhart and Rogoff’s book. Instead, This Time Is Different is really about a massive database that the authors have constructed, tracking debt (both external and internal), trade, national income, inflation, exchange rates, interest rates, real house prices, and commodity prices, encompassing virtually all the major financial turmoil reported since the thirteenth century. The book’s most memorable passages—what the authors call its “core life”—are to be found not in colorful stories about long-ago personalities (such as fill Liaquat Ahamed’s Lords of Finance: The Bankers Who Broke the World), but rather in its various tables and figures. They take some time to comprehend, but any responsible citizen can and ought to consider the evidence they present. It is overwhelming. Then there’s the portion of the book devoted to the analysis of the subprime meltdown and what the authors call “the second great contraction,” a 100-page section blandly labeled Part V. In fact, its message long ago made its way around the world, in the form of a pair of terse technical papers, each delivered (in consecutive years) to the annual meetings of the American Economic Association. The first of these, in January 2008, argued that what then seemed a “special” problem of the subprime meltdown was probably the beginning of an episode that would prove not very different from five other large-scale crises associated with long-lasting recessions (Spain, beginning in 1977; Norway, in 1987; Finland and Sweden, in 1991; and Japan, in 1992)—except that this event was happening in the United States, whence recession might be expected to spread around the world. There is nothing controversial about such a view today; but this prescient analysis appeared nine months before the recession began. The second paper, in January 2009, made the case for massive government stimulus around the world by showing that severe banking crises take a very long time to work out: asset markets collapse (real estate in particular); unemployment remains high; and, because tax receipts fall with declining output, government debt explodes. The simple statistical graphics from those two papers can be found today on the walls of most nations’ central banks. The authors have demonstrated that with appropriate evidence, the problems we are suffering through can be foretold. Lurking behind the book are a set of concerns that are implied but never addressed—perhaps a story for another day. What about the debts and currency of the United States? Might the country itself go the way of, say, the state of California—that is, become stuck in political deadlock—and, because the nation possesses the sovereign power that California lacks, begin to inflate away the burden of its debt? Or see the value of the dollar plummet in a classic currency crisis? Such collapses of confidence often have their roots in government’s unwillingness to adopt consistent fiscal and monetary measures. Just how deep is the debt hole from which the United States must climb in the coming years, when off-balance-sheet liabilities including unfunded pension and medical liabilities are taken into account? Reinhart and Rogoff write,“[T]hat basic data on domestic debt are so opaque and difficult to obtain is proof that governments will go to great lengths to hide their books when things are going wrong, just as financial institutions have done in the contemporary crisis.” The price of stability is vigilance. Reinhart and Rogoff began their collaboration at the International Monetary Fund: he was its chief economist from 2001 to 2003; she was his deputy. Both are well-qualified by temperament for the job of professional skeptic. Reinhart left Cuba with her parents in 1966, when she was 10, carrying what was permitted in those days: three changes of clothes, no more. Today, she is a professor at the University of Maryland, a veteran of many crises and probably the most widely cited woman in the profession. Rogoff, a son of liberal parents, attended high school in Rochester, New York, where the dropout rate was greater than 50 percent (and included him). A U.S. grandmaster in chess at 14, he moved to Europe after his sophomore year to compete in tournaments. At 18 he returned to Yale, did his graduate work at MIT, and, after teaching at the University of Wisconsin, the University of California, Berkeley, and Princeton, came to Harvard in 1999 (see “Harvard Portrait,” January-February 2004, page 51). A registered Republican, he advised John McCain’s campaign in 2008. The good news, then, is that This Time Is Different contains the beginning of just such a bull detector for international finance. Better instrumentation is required, much more data of the sort that the authors have assembled, including measures that take into account off-balance-sheet government borrowing and implicit debt guarantees. Better regulation, too, in the form of stringent capital ratios and greater transparency for banks—perhaps even a new international body designed to provide some support to national legislators facing domestic political pressure, a beefed-up version of the Bank for International Settlements, which has performed a diluted version of the role as a shadowy club of central banks since the 1920s. Most fundamental of all is precisely the start that Reinhart and Rogoff provide, with their charts of crisis sequences and tables of the various early warning signs—a better understanding of the intricate pathways by which “a thundery atmosphere” one day can turn into a full-scale rout the next—or subside into business as usual. Banking crises may have been to this point “an equal opportunity menace,” as the authors maintain, afflicting rich and poor countries alike. But the hope is that at least the biggest nations will get wise to themselves by adopting the sort of system of disciplined international accounting that Reinhart and Rogoff propose. David Warsh ’66, author of Knowledge and the Wealth of Nations: A Story of Economic Discovery, is proprietor of the weekly online column economicprincipals.com.